If you make old-fashioned meatloaf, you just have to try a meatloaf pan with a lift-out liner. The liner keeps the loaf about 1/4 inch above the bottom of the pan, preventing the meatloaf from sitting in a pool of grease but keeping the meatloaf moist via heat from the warm liquid. The picture is of the Baker’s Secret pan I use, with an enamel rack. 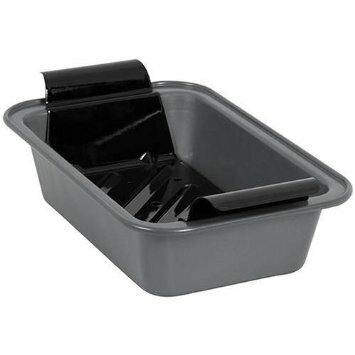 It’s not longer available, but there are similar items on Amazon.com from Chicago Metallic, I strongly recommend the ones with the long, narrow liners — the finished meatloaf lifts right out and doesn’t have to be pried out of a liner pan. So, speaking of the meatloaf itself: Last night the Scholarly Gentleman made a beef/pork meatloaf that included…toasted pecans. The result was very good, but very rich. This is meatloaf for company — reminded me quiet a bit of kibbeh with pine nuts. The discovery that my wonderful meatloaf pan is no longer available brings me to my latest vintage kitchen gadget: The Hamilton Beach Crock Watcher crock pot with Auto-Shift! The Scholarly Gentleman likes to make bean soup with ham hocks and also slow-cooked chicken thighs. My response to this has been “so use the stovetop” but we have kept our eyes open for a mid-size crock pot. Fortunately, we live in a Scandinavian neighborhood where estate sales are a treasure trove of Dansk teak, stainless steel, crystal, and superb cookware (especially Nordic Ware ebelskiver pans). 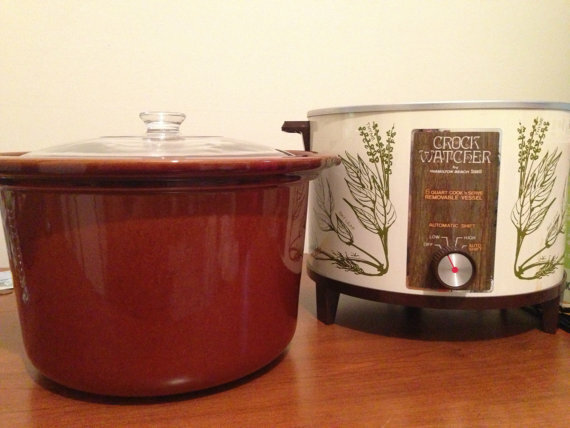 Today we spotted a 60s-era crock pot in pristine condition, complete with original instruction manual, for $8. The Auto-shift setting allows you to start it on high and have it automatically turn itself down to slow cooking after 1-3/4 hours. 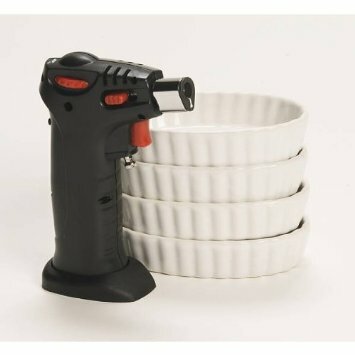 Veering from the practical to the frivolous, I dropped $5 on a Bialetti Creme Brulee Set — four white ceramic ramekins and a little butane blow torch. While rationales like “Oh, wouldn’t it be fun to cook [insert ridiculous dessert here]” rarely work for me, the fact is that creme brulee is the dessert the Scholarly Gentleman and I are most likely to order when we go out. So perhaps it does make sense to try it at home. Once again, I discovered that this item is no longer available (original price: $35), but that it got 5-star reviews on Amazon when it was and that this basic Oggi set appears nearly identical. This entry was posted in Cooking, Food and tagged creme brûlée, Crock Watcher, crockpot, ebelskiver, meatloaf pan, Slow cooker. Bookmark the permalink. The NordicWare item I use most is the Microwave Pressure Cooker–they cost a chunk new but are cheap used from folks who were given one as a gift and never tried it. The good news? Perfect rice, corn on the cob, four stir risotto–really, whatever I’ve thrown at it so far. The bad news? The small recipe book. I’ve tried to find more recipes online and discovered that someone had systematically hit *every* post mentioning one with a first post which was a lengthy attack reciting the details of how his was defective and how NordicWare wouldn’t replace it. The one site he missed was for pressure cooker fans, and the poor soul who asked for recipe suggestions there was attacked by the site owner for using a cooker that was too small and didn’t come up to a high enough pressure, and ordering him to quit posting until he got a REAL pressure cooker. I’ve done creme brûlée for guests. You’re supposed to do the burnt sugar shortly before serving, which works out splendidly—invite them to wield the torch. Lots of fun. Janet, discretion would be required. Not all my guests are certified to handle a blow torch! I have that exact same crock pot. I bought it new in 1977 and am still using it all the time. As I type the crockery liner is in the dishwasher after another successful meal cooked yesterday. So, I’ve been using this for almost 38 years! I’ve done the traditional soups, roasts, etc in it, but also the most delicious cheesecake I’ve ever eaten and baked cinnamon rolls recently.